The concept pairs images and music (read “sound and light”) in ways suitable for a high tech setting like MIT. The music for piano four hands and voice with piano from Paris between 1900 and 1926—a fertile period for visual and musical experiment—will be enhanced with projected images of artworks from nature as well as period stage and costume designs by Picasso, Léger and Roerich for Ballets Russes and Ballets Suédois. 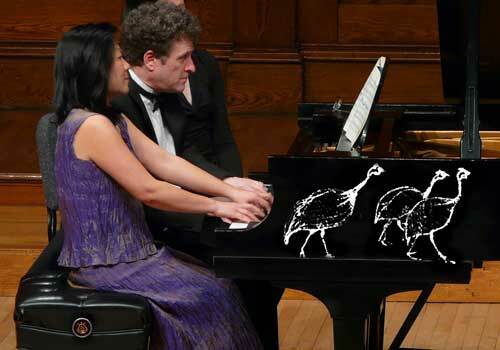 The performers are: David Kravitz, baritone; Randall Hodgkinson, piano and Mihae Lee, piano. The program details are listed in BMInt’s ” Upcoming Events.” BCMS Artistic Director Marcus Thompson has kindly made his very interesting program notes available here.